It's official. Announced alongside the Vivoactive 3 and Vivosport, the upgraded Vivomove is finally here, and while it retains the analog-style timekeeping it adds a whole lot of new features to a svelte and stylish design. The Vivomove HR adds a touchscreen display, getting rid of the original's bars for something a lot more context-sensitive. We've seen a couple of hybrids that build displays into the watch face, but they're usually relegated to a small corner. This time, Garmin has another idea. Until we get our hands on the Vivomove HR for a full, thorough review, here's everything you need to know about Garmin's attractive new hybrid. The most obvious design change to the Vivomove HR is that it looks like a regular watch. There's a kind of generic classy feel to the Vivomove HR, but it hides a secret display underneath that analog veneer. 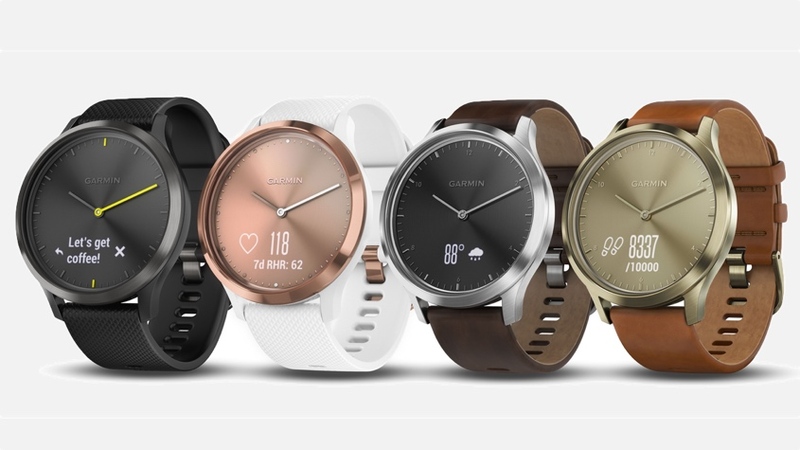 This is a welcome change from the previous Vivomove, which improved on Garmin's design aesthetics significantly but still looked like a fitness watch. It was also noticeably a fitness watch that was aimed at men, but Garmin is rectifying that this go around with a wider variety of styles - like a rose gold watch with a white strap - that creates a better gender balance. Adding to the variety are two editions. Both of them have full steel bodies, but there are slight differences. The Sport model comes with sport bands while the Premium model comes with leather bands. Spoiler: The Premium is also more expensive. The Sport's large model is black and comes with a black band, while the small model is rose gold with a white band. The Premium's large model is silver with a dark brown leather band while its smaller version is gold with a light brown band. The watches are quite svelte, coming in at 11.6mm thick. Despite the heart rate sensor, we found them to be perfectly comfortable in our hands-on time, and not too bulky. One thing to note: The Premium is significantly heavier than the Sport, 56.5g versus 40.8g. The big key to the Vivomove HR, however, is that secret OLED display. When it's off, you've got a nice watch on your wrist, but when it's on you've got something a little more fully featured. The touchscreen remains off until you want to check in and glance at your info. You just need to give the screen a little tap, and the portion at the bottom of the watch face will light up with some 4-1-1. You can also swipe left to check on things like step count, stairs climbed, stress scores and resting heart rate. You're not going to be staring at this screen for too long. Thoughtfully, all the information here is given to you via a combination of minimalist icons and texts; it's truly glanceable. After a few seconds of no contact with your swiping fingers, the touch screen will turn off and you'll be looking at your fancy watch again. So what about those watch hands? Shouldn't they get in the way of all that swiping? Turns out they automatically move to the top of the watch face when you wake up the touch screen, giving you some runway to swipe to your heart's content. By the way, the touchscreen will also be used for smartphone notifications, as you can get your emails, texts, calls, app alerts and social media buzzes right there on your wrist. You'll also get things like music playback. We found the touchscreen to be very responsive while swiping, though it sometimes did take a couple taps to wake up the display in the first place. Regardless, it's a slick way to integrate a touchscreen display in an analog watch. Last year's Vivomove had a solid base of fitness features. You could track steps, get an estimated calorie burn, monitor sleep patterns and distance tracking via an accelerometer. However, that information was delivered to you via two bars on the watch face. This time, they're delivered via that touchscreen display, which has the benefit of being able to give you more detailed info than a bar ever could. Garmin is also pushing to include as many of its fitness features as possible. Thanks to that heart rate sensor, there's now VO2 Max support and all-day stress tracking via heart rate variability. There are also dedicated sports modes for walking, running, biking, cardio and strength training, which will let you count reps in the gym. Garmin IQ is also on board, which means it'll automatically stop and start a walk or run. If you're big on the outdoors, you'll be happy to know there's also support for Garmin's VIRB action camera and LiveTrack. Your data, as always, will live on Garmin's Connect app platform. Oh, and both the sport band and watch are good to go for swimming. That touchscreen and the heart rate sensor come with a price: battery life. While you didn't really have to worry about the battery on the previous Vivomove, you will have to pay a little more attention this go around. On the HR, you'll be able to expect about five days of battery in smart mode and two weeks in watch mode. While there's no hard release date for the Vivomove HR, you can order it now on Garmin's website, where it says processing time is about five to eight weeks. That means you can likely expect it in October or November. You'll be able to purchase the Sport model for $199.99 and the Premium model for $249.99.